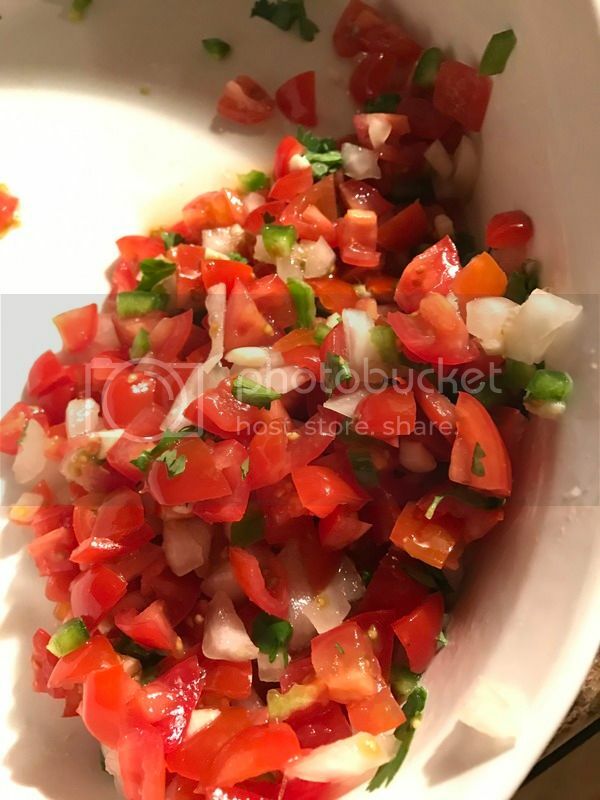 I'll start this post by saying that I don't even like pico de gallo because I can't stand onions, so the raving review I got for this recipe was from a friend. I threw this together without a recipe, but I'll tell you how I made it! An alteration to traditional pico was the addition of garlic - we're garlic fiends around here, so it goes in everything. Mix it all together and let it sit for at least an hour so the flavors can marinate. You're done! I'd never made this before and this is one of those recipes that can be tweaked and ingredients can be added or taken away to your taste. It was easy to make and prep time was only about ten minutes. Try it sometime! A few nights ago I made cabinet tacos. Super easy. Grab stuff from your cabinet, prepare it and then my favorite part: MAKE TACOS AND STUFF YOUR FACE! 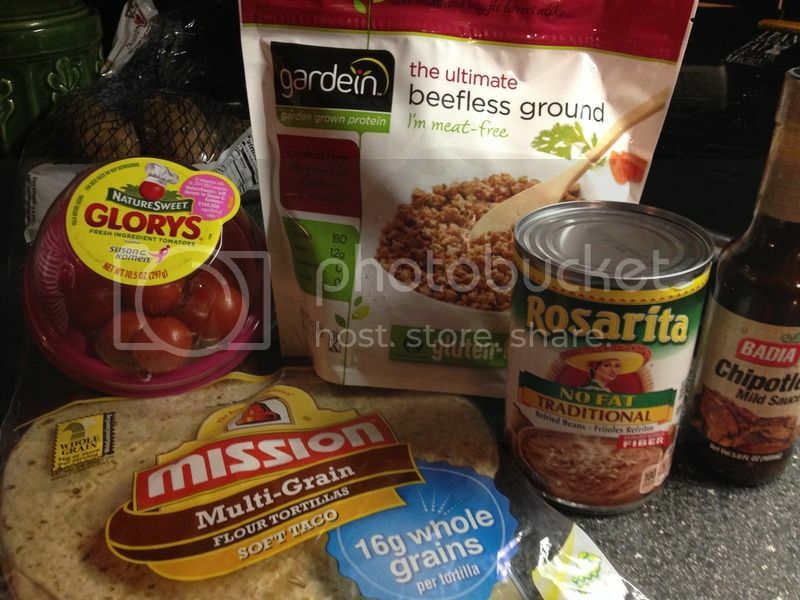 I pick up most of my taco supplies when I have Cartwheel deals and coupons. It's a quick and cheap dinner that's almost always on hand if you pick up things when you pass them. The best part? Leftovers! I'm a huge fan of leftovers. Sometimes I prefer them. Well, with tacos, the leftovers are so easy to take to work the next day: taco bowls! Omit the tortilla, throw your leftover ingredients in a bowl, top it with sauce, and TA DA! Lunch. Check out some of the recipes I've found around the internet - just click the picture for more information! It's still cold here, so here's a recipe for chili! The science of salad. I love this article! The 21 best vegetarian/vegan restaurants in America. While these are Christmas recipes, this is a great list of vegan potluck dishes! Asparagus salad with roasted chickpeas. Drooling. 17 cooking hacks every vegan should know. Brussel sprouts and potatoes in tomato gravy. Organic, no-bake energy balls - swap out the honey and they sound perfect! Four words: SPROUTED. HUMMUS. CUCUMBER. CUPS. This recipe for vegan and gluten free mac & cheese looks amazing. I absolutely adore cookie dough. Here are some vegan cookie dough bars! I'm not usually a big fan of trail mix, but this sour cream and onion version sounds great. This recipe for peach cobbler looks delicious. The best and easiest vegan and gluten-free pita bread. Just nix the ricotta, and this recipe sounds delicious!